The Lyndon Baines Johnson Museum of San Marcos is mourning the passing of Honorary Board Member Patricia (Pat) Murdock who served the museum, Texas State University and the San Marcos community with devotion for more than a half century. Pat died on Sept. 22, 2016 after a valiant battle with cancer. Born Aug. 30, 1939 in Elgin, Pat grew up in Knobbs Springs in Lee County and graduated from Lexington High School. She moved to San Marcos in 1959 to attend Southwest Texas State University (now Texas State). 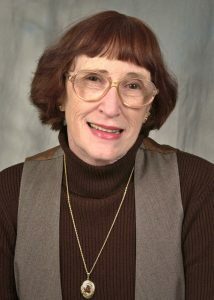 She earned a BA in journalism and English in1962 and a Master’s Degree in guidance counseling and English in 1969. She met her husband Rennie Murdock at Wallings Creamery downtown and they married in 1960. Pat worked at Texas State for more than four decades, serving as its news and information director for 23 years. She fostered a strong “town-gown” volunteer spirit that continues today. As a young university employee in 1965, Pat helped organize the ceremony at Southwest Texas State where President Johnson signed the Higher Education Act of 1965. Fifty years later, in 2015, both Texas State and the LBJ Museum commemorated that legislative landmark, as well as other signature Voting Rights, Civil Rights and Medicare legislation achieved during LBJ’s presidency. Pat initiated the museum’s annual Christmas Tree Lighting Ceremony in 2009, inviting elementary school children to sing carols and the mayor to light the tree. Santa Claus was a surprise visitor who continues to delight the children at this event. This year, the Museum Board elected Pat Murdock as an Honorary Board Member, joining Ted Breihan, Eleanor Crook, LBJ’s grandson Lyndon Nugent, Libby Linebarger, Virginia Woods, John L. Navarrette, Sherwood Bishop and Patty Sullivan. Pat was also active in many community organizations and events, including the American Legion Unit 144, San Marcos Summerfest, the Republic of Texas Chilympiad, Texas Special Olympics, the local U.S. Bicentennial committee and the San Marcos Sesquicentennial celebration. She was inducted into the San Marcos Women’s Hall of Fame and was the first recipient of the Southwest Alumni Association’s Key of Excellence Award. Pat was preceded in death by her parents, Stella Naomi Pollock and Leo Dismukes of McDade, and by her husband Rennie Murdock, who passed away in 1994. She is survived by her children Gayla Renae Murdock Hill (Truitt) of San Marcos; Andrea Leigh Murdock-McDaniel (David) of Oak Leaf; William Bryan Murdock of Austin, and Cheryl Lynn Murdock of Austin, and her brother, Ray Alec Dismukes of McDade. Also surviving are granddaughter Jennifer Hill Henning, great-grandchildren Daven Henning and Taylor Henning, and step-grandchildren Kate McDaniel and Coy McDaniel. Pat was buried at the Knobbs Springs Cemetery after visitation at Pennington’s Funeral Home in San Marcos on Sept. 26 and a celebration of her life at Knobbs Springs Baptist Church in McDade on Sept. 27, 2016. Texas State is accepting contributions to a scholarship in her memory at Texas State University, Advancement Services, JCK-480, 601 University Drive, San Marcos TX 78666.